Logically, a leaf blower should terrify a prey animal -- a loud, monstrous, foul-smelling device pushing out a strong stream of air should send him running for safety. This buck, however, seen in a video posted on Facebook by Central Texas Bowhunter, seems to love it. In fact, he puts his face right up to the blower several times, occasionally lifting his head to get air on his neck and turning it from side to side as if to say, "Right here, please. Now right here. Ah, that's it." The person running the blower politely obliges. Playful fawns are not unusual; a blog article written by a University of Georgia researcher notes that fawns will often play together in games that resemble tag or king-of-the-hill. A single fawn can entice his mother into playing with him by standing in front of her and "shaking its head and shoulders from side to side" until she chases after him. 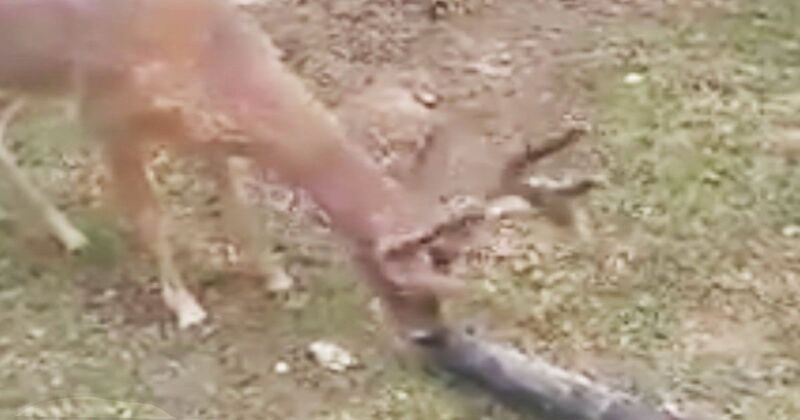 That action isn't dissimilar from what the buck is doing in this video, but it seems unlikely that the noisy leaf blower reminds him of another deer. It's hard to say what the deer sees in the blower, but there are plenty of dogs who would agree that they're wonderful toys; kind of like a portable car window! What do you think this buck is getting out of this encounter with the leaf blower? Please SHARE this story and let us know your thoughts in the comments below!